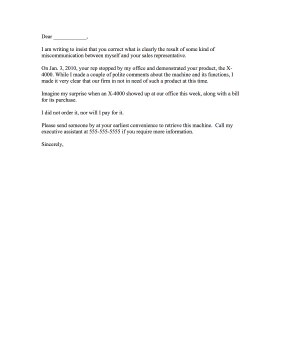 This product complaint letter warns a company that the recipient did not order the product and will not pay for it or shipping. I am writing to insist that you correct what is clearly the result of some kind of miscommunication between myself and your sales representative. On Jan. 3, 2010, your rep stopped by my office and demonstrated your product, the X-4000. While I made a couple of polite comments about the machine and its functions, I made it very clear that our firm in not in need of such a product at this time. Imagine my surprise when an X-4000 showed up at our office this week, along with a bill for its purchase. I did not order it, nor will I pay for it. Please send someone by at your earliest convenience to retrieve this machine. Call my executive assistant at 555-555-5555 if you require more information.